A dual monitor stand, like this flat screen mount, can enhance productivity, as users are able to have multiple programs open on each of the screens. This rack is revolutionary and will definitely save space on any flat desk or table, as it measures only 28 in W x 20-1/2 in H x 6 in D! A plastic cable clamp, which is included with the system, can be positioned under each arm bracket to help organize power cords! This feature will keep the area behind the computer tidy, neat and safe! 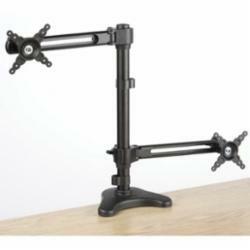 This LCD desk mount, dual monitor stand that adjusts to support a computer screen in vertical or horizontal orientation is used by a wide variety of professionals on a daily basis! Although each arm bracket is tight, users are able to manually rotate the display with two hands, when layout modifications are necessary. This attribute is valuable to customers who read or review long website content and need to view a larger size of the page in order to make comments, corrections or observations. This dual monitor stand that can increase productivity provides multiple options to users. Those who have purchases these display holders for LCD televisions appreciate the added elements of versatility that the design offers and continues to be a cost-effective, affordable model! This multiple display holder, dual monitor stand that will hold display screens measuring up to 24 in is ideal for professionals that edit video content or modify images every day. While this LCD rack can hold two televisions weighing less than 18 lbs. per screen, it is recommended that users position each TV closer to the pole to minimize strain and balance each mount. The computer display rack, dual monitor stand features a desk clamp, which can be detached for permanent fixture placement with the bolt system. Customers who have utilized this feature have creatively positioned this rack permanently in settings like retail stores, trade show exhibitions, museums and art galleries to inform guests of pertinent information. This dual monitor stand can mount multiple screens and is the smartest tool to help increase productivity in businesses today!. Mounting plate can replace clamp to secure as permanent workstation! Isolated brackets enable users to modify one television height without obstructing the other! 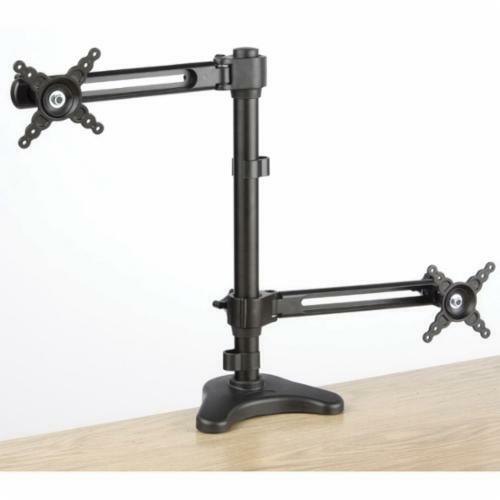 Articulating arm allows customers to adjust screen distances from user accordingly! Brackets designed to quickly and easily convert from vertical to horizontal layout!